Shadowscale Partisan is a common Agility creature card. It is part of the Heroes of Skyrim expansion. "Just speak the name. Their life will end." "You're a dangerous sort. I like it." This card's summon ability applies the Deadly Scales card effect. 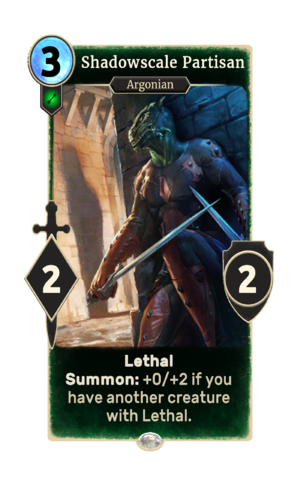 Shadowscales are an order of Argonian assassins. See the lore article for more information. The card depicts Veezara as he appears in Skyrim. This page was last modified on 27 February 2019, at 23:01.